Six high school graduates have their friendship tested when they are stranded on a lake by a deadly sea creature. Johnny dreams that the girl he has a crush on, Kitty, is attacked by a sea creature while swimming in Black Lake. In the morning, Johnny and Kitty join four of their high school friends to celebrate graduation by partying at the lake. Driving the car is Simon. In the passenger seat is Simon’s brother Matt, who is Kitty’s boyfriend. The other friends are Deb and Zeke, an aspiring filmmaker who records everything with a camera strapped to his wrist. Their car is nearly involved in a collision when Simon is distracted by his brother making out with Kitty. At Black Lake, Johnny tries to give Kitty a necklace that he says will protect her, but she feels embarrassed about wearing it. An old man named Mr. Parks arrives and asks Johnny if his grandfather knows he is taking friends out on the lake. Johnny insists that everything will be okay as they are just going to the other side and no one will swim in the water. Mr. Parks reminds Johnny that the boy has a responsibility. All six friends take a single rowboat to the center of the lake. Over Johnny’s objections, Matt insists on swimming. The two girls join him. Simon passes the time on the boat with fireworks while Zeke continues recording. The three swimmers return to the rowboat after they detect something strange in the water. The brothers then use the two oars to jab at a sea creature. When Simon drops his oar into the water, Deb is bit by the creature while reaching for it. Her friends try to tie off the wound, but Deb dies after the creature destroys the floating oar. Simon tries paddling the boat back to shore with just one oar. He jabs at the creature again and break the oar. Simon then uses the splintered shaft to stab into the creature and it becomes lodged in its body. The friends learn that Johnny knew the creature existed. Zeke suggests using Deb’s body to distract the creature. The monster takes the bait while the crew paddles with their hands, but they only travel a short distance before the creature returns. Matt uses the cooler lid as an oar until the creature bites it away from him. The teens throw their snacks in the water as bait. Zeke suggests voting for one of them to go into the water as bait. Johnny is selected. Wearing his necklace, Johnny jumps into the water and swims from the creature while the boat paddles in the other direction. The creature eventually returns to the boat and the quartet uses the fireworks as a distraction. When the others elect Zeke as the next distraction, he tries to save himself by telling Matt that he has footage of Kitty and Simon making out. Kitty and Simon deny the accusation. Zeke is forced into the water with his wrist camera and the creature kills him. Johnny makes it safely to shore. Matt finds a hatchet in one of the bags. Simon uses the cooler as a paddle but the creature destroys it. Kitty hacks at the creature by using the hatchet. Johnny returns with a motorboat and offers to tow the others. After he throws them a line, the creature attacks. Johnny becomes tangled in the rope and is strangled. Kitty stops herself from severing the rope and saving Johnny. The brothers try to pull the motorboat towards them, but it capsizes. Simon uses the hatchet to break boat pieces into makeshift oars. Matt confronts Simon and Kitty about their affair. After an extended argument, the brothers throw Kitty overboard and she disappears. Shortly thereafter, the brothers wrestle with each other and fall into the water. The creature kills Matt. Kitty floats on the hull of the overturned motorboat. Kitty eventually swims back to shore, as does Simon. Kitty confronts Simon about killing Matt and Simon then strangles Kitty. Mr. Parks arrives and confronts Simon about the footage he found on Zeke’s camera that washed ashore. Mr. Parks forces Simon back into the water at gunpoint, where he is killed by the monster. Johnny’s necklace is seen in the water. Click here for the review of Ben Ketai's 2013 "Beneath" about miners trapped underground. “Beneath” has its tone meter calibrated a little too far into serious territory when it would have benefitted from a slier wink of black comedy. The film is only as good as it needs to be for a rubber water monster movie on Chiller TV, when clearly the actors and the production are better than the script that they have to work with. The story begins by introducing an unbelievable collection of teenaged friends that exists at no real high school in the world, yet populates every B-movie with a slasher-type theme. The jerky jock brothers like to spit out barbed jabs at their so-called chums. Kitty is the girl that all the boys lust after. Johnny is the resident good guy with Johnny Depp style. Deb is the sassy Plain Jane that pads out their numbers. And Zeke is the token nerd whose wrist-mounted camera annoys everyone with his constant filming. No, “Beneath” is not “found footage.” Although that might have gone a long way towards helping the film hide the receipt that pops onscreen whenever the creature appears. What starts as a celebratory post-graduation weekend of partying on Black Lake becomes a battle against a sea monster when the teens’ rowboat is stranded in the water. The sea monster is in a battle of its own against the budget with a bug-eyed appearance guaranteed to elicit at least one chuckle, if not a grimace. As a practical effect done on the cheap, it does the job well enough. Only a few times does director Larry Fessenden allow the camera to show too much of the creature. Though perhaps if something different had been done at least with the saucer eyes, it could have looked less silly in the close-ups. Rivaling the nautical cryptozoid for the most distracting element of “Beneath” is the lack of charisma across the board on the character set. The young actors do fine work with their limited roles, but their performances are only able to match the material, which is not very good. Whether intentionally or unintentionally, none of the characters are likeable. Excepting the first teen to die, who does not have enough time to develop a full personality, the other five all have a moment in the spotlight to show an arrogant and ugly side of themselves. The net result is that the audience cannot wait for all of them to have creature teeth embedded in their torsos. This is a perfect sentiment assuming that the movie wants viewers to relish the slaughter, but not so great for creating any emotional attachment to the carnage onscreen. In order to make it back to shore, the teens have the bright idea of forcibly sacrificing themselves one at a time to give the sea beast a distraction. Voting one another off the boat Survivor-style, this is precisely where a heavier spoonful of black comedy would have made the absurdity easier to swallow. The humor instead comes from how quickly they arrive at the conclusion that human bait is their best chance of survival, and no one voices any dissent over the preposterous plan. The ridiculousness ratchets up even more when they remember that they have fireworks onboard and then later find a hatchet in one of their bags to use as a weapon. All of this takes place after several of them have already perished. Shouldn’t they have exhausted these other resources before resorting to throwing people overboard? 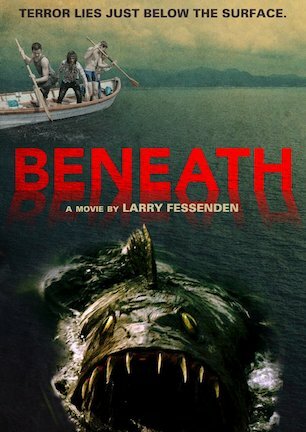 As a low-budget killer monster movie intended for cable television, “Beneath” does meet the low bar of expectations that goes with this sort of territory. Fessenden and company wrung the budget dry and seemingly did everything in their power to make lemonade from a lemon of a story. “Beneath” could have had cult classic charm had it taken a self-aware approach by nodding at its goofier aspects, of which the script has plenty. Nonetheless, the straightforward take on the tale has a few moments of entertainment in store, even if the total experience goes right through the eyes without ever registering in the brain. August 6, 2013 by Ian Sedensky.